Are YOU searching for an HONEST carpet cleaning company in Miami? YOU came to the right place. We provide all Miami area residents with professional carpet cleaning, upholstery cleaning, tile grout cleaning, mattress cleaning, and area rug cleaning services with no Hidden Charges or Bait & Switch Tactics Ever GUARANTEED. When we clean YOUR carpet we use a POWERFUL 6 step DEEP cleaning process to provide YOU with The Most Thorough Carpet Cleaning service possible, when we steam clean your carpet we remove more than DIRT we remove many contaminants that can cause allergies from YOUR carpet creating a Healthier home for YOU and YOUR Family. Give us a call for a FREE no obligation quote 305-631-5757. "DISCOVER How Our Powerful Six Step Deep Carpet Cleaning Process Will Leave Your Carpet SUPER Clean Guaranteed...Or it's FREE"
We use all necessary steps at NO EXTRA COST to you. While other carpet cleaning companies charge YOU extra for every single step, we include all steps in our cleaning process. We are PROUD to be an HONEST carpet cleaning company in Miami. "You'll Get Our 10 DAY CLEAN GUARANTEE When We Clean YOUR Carpet, Upholstery Or Tile"
You'll get 100% satisfaction GUARANTEED on all our cleaning services, but your total satisfaction is our main priority that's why we provide YOU with our 10 DAY CLEAN GUARANTEE. If for any reason your not completely satisfied with our service or if any spot or stain re-appears call us back during the first 10 days after our cleaning and we will come back and re-clean the affected areas again at no cost to you. If for any reason you are still not satisfied we will simply reimburse your money back on the areas you are not satisfied NO QUESTIONS ASKED PERIOD. We just don't disappear after cleaning your carpet, upholstery or tile and grout we call every single client 2 days after cleaning to do a follow up call and quality control to assure YOUR TOTAL SATISFACTION, what other carpet cleaning company in Miami is going to give YOU this peace of mind? Many	carpet cleaning companies in Miami won't provide or neglect these necessary steps to provide the BEST cleaning ever. Many companies run their cleaning solution through their equipment without even pre-vacuuming or rinsing the carpet leaving behind detergent residue that causes premature re-soil of your carpet. That's why we provide our clients in Miami with our POWERFUL 6 step deep carpet cleaning process to leave your carpet clean and residue free. 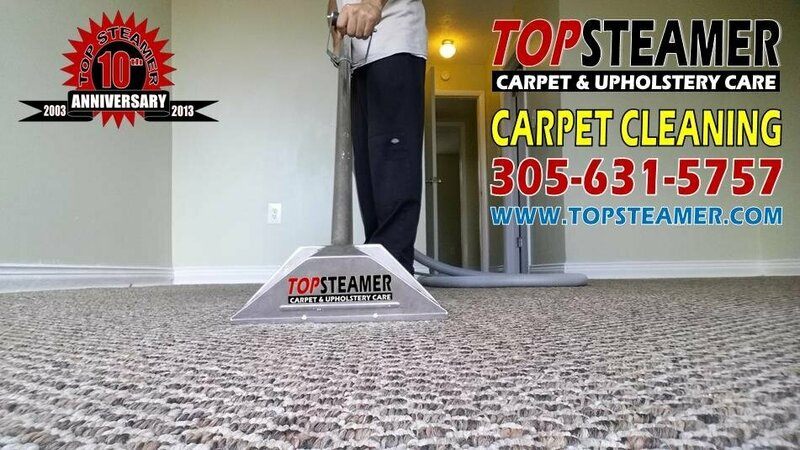 That is what makes Top Steamer ahead of the competition in carpet cleaning services in Miami, Fl. Great, now that you have discovered how our POWERFUL 6 step deep carpet cleaning process will give you the BEST cleaning ever, It's time for you to DISCOVER what carpet protector can do for your carpet. 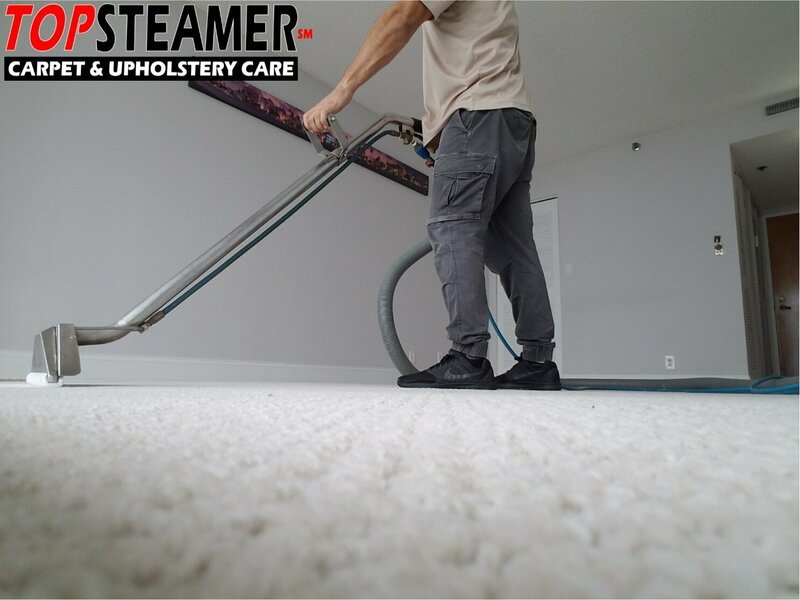 Now that you have learned that Top Steamer provides nothing else but SUPERIOR carpet cleaning services in Miami, you need to know what carpet protector can do for your carpet. Carpet protector will protect your carpet from accidental spills that may stain your carpet fiber and create a permanent stain that will only come out with special spotting techniques. Your carpet comes with stain protection properties already from the mills and we can re-apply that protection again with our carpet protectors. Carpet protectors stop spills from penetrating the fibers of your carpet giving you time to clean the spill without staining the carpet and it will prolong the life of your carpet. Call us now for a FREE consultation at 305-631-5757 and remember Top Steamer gives you top service for your cleaning needs. Call now to scheduled your appointment and get your carpet REALLY clean with our POWERFUL 6 step deep cleaning process and feel the difference of REAL CLEAN CARPET. Don't forget to ask about our specialty carpet protector. For a limited time only, online clients that mention our website will receive a $10.00 OFF On Carpet Cleaning valid through 04/30/19 Hurry CALL US NOW 305-631-5757 or click here to see our monthly cleaning specials. Written testimonials sent by our customers. "Keep up the good work excellent carpet cleaning service. I'll recommend you anytime, thank you." "You guys did an excellent job cleaning my carpets, I wont have to replace them and my apartment is ready to rent, thank you Top Steamer for such a wonderful carpet cleaning job." "Thank you so very much for transforming the MOLD MOBILE back into a Honda." "I have a dog in my apartment Top Steamer has been cleaning my carpet every three weeks for the last three years. They are very good, professional, reliable and trust worthy. I truly recommend them." "Marlon & Gabriel from Top Steamer have been cleaning my carpet for the last 2 years, they always do an excellent job thank you very much." "Our Carpet had many weird stains and was very dirty, we were afraid it would be extremely difficult to remove. I found Top Steamer on the internet, they came over the next day and did a wonderful job! I can't believe how great it looks, we are extremely pleased with the results, thank you!" "I contacted Top Steamer after I learned about them through an internet search. Their website inspired me with confidence and I particularly liked the fact that they appeared to be environmentally conscious. After one quick call I was able to arrange a cleaning session for the following day. I immediately noticed their high level of professionalism. Both Marlon and Gabriel arrived on time and quickly went to work with a huge machine. It took them no time to leave my carpet looking and feeling like new, even some hard looking stains were gone when they finished the job. I was pleasantly surprised too that they didn't make any kind of mess. From moving the furniture to taking care of the dirt in the carpet everything went smooth and perfect. Next time my carpet starts to look soiled and dirty, I know exactly who to call." if I could give them 10 stars I would!! the entire experience was flawless. from the very beginning the self serve online appointment desk is amazing. I have never seen anything quite like it. VERY efficient! they came to my home at 9.30 and got right to work. they left at noon and my sofa, 2 club chairs, ottoman and pillows were SPOTLESS! I was in awe! my sofa is over 10 years old and is lived on by my dogs, it was FILTHY and I contemplated throwing it away. the chairs were the same. I thought I would give Marlon at Top Steamer a try. they cleaned and cleaned and cleaned until they were confident I would be happy. I was ecstatic, if I knew how to do cartwheels I would have. I now have a reliable, honest cleaner in south florida. oh - and they did not play games with the pricing. the price was as stated on the internet, no sales pitches or markups. ONLY GO TO TOP STEAMER! Our powerful hot steam water extraction cleaning process removes all dirt leaving your carpet super clean. Get your carpet nice and clean this spring, watch our newest video demonstration. Foto de antes y después de una limpieza de alfombra realizada en un apartamento en Brickell Heights. La alfombra tenia muchas manchas de bebidas derramas y manchas de orines de perro que pudimos remover satisfactoriamente. Amazing before and after picture of a sofa we cleaned in Coconut Grove. Chocolate syrup spill, pet hair and odor. See picture and compare the differece. Getting this carpet nice and clean in Kendall. Customer getting his carpet deep cleaned to start the new year fresh with clean carpet. The average bacteria in a homeowners carpet is approximately 200,000. Don't let this happen to you. Watch Video Now!